Barnes & Noble have released their B&N nook eReader app for the iPad. Designed specifically for the iPad, this app gives B&N customers access to more than one million eBooks, magazines and newspapers in the Barnes & Noble eBookstore, as well as the existing content in their Barnes & Noble digital library. The app works using your B&N account, or you can register for an account on the web. New users get 3 books to get started with. Books are shown using the cover art or in list view. Read in both portrait and landscape. NOOK’s reading pane is fully customizable. Adjust font size, color, line spacing, margins, font types, brightness, paper color and themes. Tap to pick any word, drag to highlight a selection. 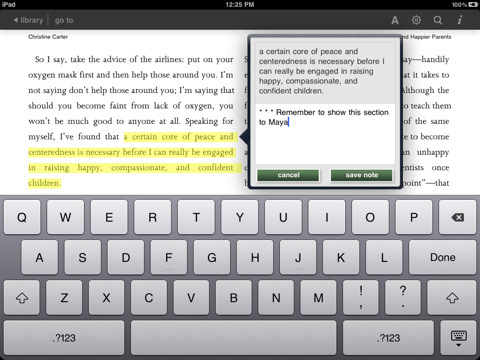 Find words in the included dictionary, store a bookmark, save notes, or highlight text. Jump to the table of contents and saved notes easily. Using NOOK’s LendMe, you can let your friends borrow books you own from B&N to read from their app. You just have to enter your friend’s email address. During the 14 days, the books are removed from your collection while out on load to a friend. You can sample parts of full books or find free eBooks to download. A Credit Card number is required even if you just want to download free books. 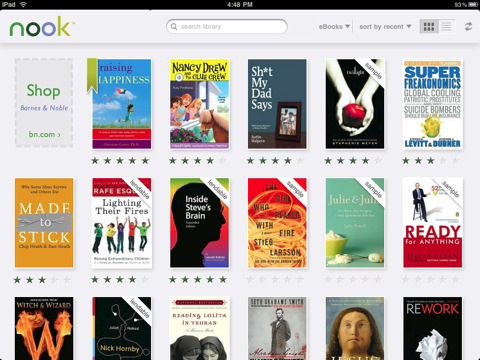 Overall, the nook iPad app is a powerful iPad reader app and syncs all your books wirelessly. New users will have a tough time buying books, since it shoots you off into web browser. There doesn’t seem to be a way to sync your existing ePub eBooks to the iPad app. Be sure to also check out the iPhone version of the nook app for on the go reading. AppSafari review of NOOK for iPad was written by Joe Seifi on March 11th, 2010 and categorized under App Store, Books, iPad apps, Reading. Page viewed 5881 times, 1 so far today. Need help on using these apps? Please read the Help Page.